Hello, blog readers and email list subscribers! 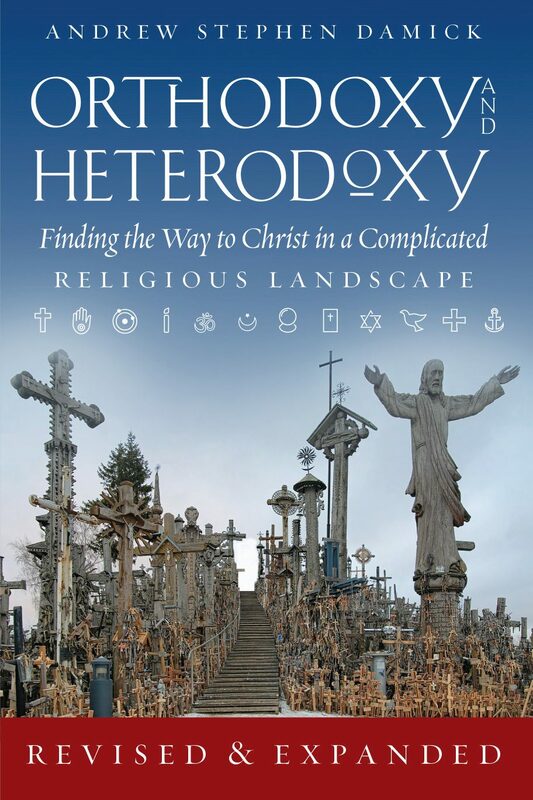 — The revised, expanded edition of Orthodoxy and Heterodoxy: Finding the Way to Christ in a Complicated Religious Landscape is now available for pre-order. Wondering what’s new? Read all about that here. Click here to place your order and reserve copies for yourself and your parish bookstore. Sign up at our Facebook page here. The full title is “The Areopagus: Historic Christianity Encounters Other Religious Traditions.” The podcast is about the encounter of historic Christianity with other religious traditions. We’ll have many topics and frequent guests. Michael is a pastor with an Evangelical background, serving in a mainline Protestant church, who loves the Church Fathers. And we’re good friends. We’ll let you know more soon. I am very much looking forward to this podcast. Thrilled to see you and the Pastor are friends. I am a recent convert and still trying to sort out how to deal with these issues. I have experienced things I did not expect, and that being from both sides. Keep us posted please, as to when the podcast starts. Thank you! Father Damick, do you look at the Catholic Charismatic Renewal in either the Catholic or Pentecostal sections of your updated book? In the latest Alpha Course (https://en.wikipedia.org/wiki/Alpha_course) video Father Raniero Cantalamessa, the Pope’s Personal Preacher is interviewed about how he loves to speak in tongues. See here: https://youtu.be/yJM7gtc3skQ?t=23m23s. Just wondered if whilst looking at Pentecostalism you also look at the Catholic Charismatic Renewal? When you were working on the chapter on the Pentecostal and Charismatic movements, you made some or all of that chapter available. After I read it, you and I had a brief exchange on Twitter regarding Fr. Dennis Bennett, the “father of the Charismatic renewal” and someone I was privileged to know personally in the last year of his life. For years I never passed up an opportunity to proclaim that the pentecostal and charismatic movements were completely separate and should not be conflated. I had such a high view of the origins of the Charismatic Renewal and saw that it had done a lot of good in several protestant denominations and worldwide. I had a much lower opinion of the Pentecostal movement and saw what I considered bad fruit from it. Reading that chapter you wrote and listening to your lecture (both excellently done, by the way) I began to ponder these two movements further. I don’t know if this came up in your research, but I have often heard that the Charismatic Renewal was a restoration or manifestation of the Father’s love. I’ve heard from many people, especially those from mainline denominations (Anglican, Lutheran, Presbyterian, etc.) who stayed in those churches and were impacted by the Charismatic movement. Most of them, when summarizing what that movement meant for them would make mention of a feeling that God the Father became more real to them and they felt, often for the first time, that God truly loved them. Tongues and other manifestations would have been secondary to them and would have been treated as something to aid in their private spiritual lives, not something to be used in corporate and liturgical settings. However, many people, probably the majority of people who came into the Charismatic movement ended up leaving their churches for churches with charismatic worship, usually with almost no liturgy and an emphasis on the free use of the charismatic gifts. As much as I would like to keep the label “Charismatic” away from this development and reserve it only for those who stayed in their denominations and didn’t emphasize tongues and other gifts above the sense that their hearts were warmed by God through their experience, I have to admit that any real analysis of the Charismatic movement and its historical development would be led to conclude that within 30-40 years of its birth it was practically indistinguishable from pentecostalism. Thank you for your excellent research and analysis and for forcing me to take a more realistic look at what the Charismatic movement has become.